A More Stable Denture Awaits! There are few things more frustrating than a denture that doesn’t fit properly. Not only can a shifting denture be cumbersome, but it can also lead to excess sores on your gum tissue. If you’re using denture adhesive for longer than a month and you aren’t getting used to a new denture, you’ll need to have your current one relined, repaired or even replaced. 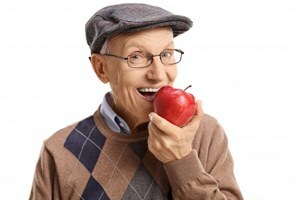 Alternatively, those with dentures can also consider an implant-retained restoration instead. If you need either a partial or complete denture made, contact our office to schedule your next consultation! An implant-retained denture is custom-made to fit with a series of dental implants already placed inside of the jaw. Keep in mind that just because you’re replacing several teeth at once does not mean that you need a dedicated implant for each tooth. Most implant-retained dentures snap on to four to six implants, however some individuals only need as few as two! This of course depends on the extent of available bone inside the jaw, which you’ll be able to determine during your consultation and exam at our office. 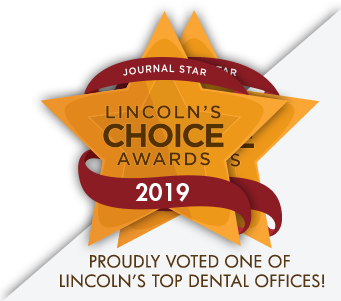 The better our office plans your implant placement, the more successful your treatment will be. Candidates for implant-retained dentures must have good oral health in order to receive any oral surgery. This means no decay should be present as well as no gum disease. Healthy gums are crucial to ensuring that the implant properly heals around the titanium post after placement. Additionally, candidates should also have sufficient bone volume for the implants to adhere to. 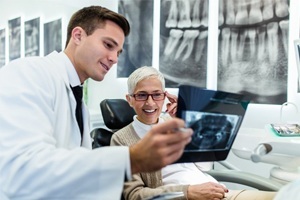 In many cases, dentists can work with potential candidates to maximize usage of current bone tissue. However, some cases will require additional treatments, such as bone grafts or sinus lifts, before implantation can be considered viable. During the planning stages, our dentists will closely examine your current oral health and bone tissue. If you are eligible for treatment, we’ll begin the planning stages of your dental implant placement. Once planned, we’ll schedule you for oral surgery at a later date to have the implants placed in our office. After your implants are placed, you’ll need to allow the posts to integrate with your bone tissue over the next several months. After full integration, our dentists will place a healing cap over the implants in order to promote proper healing of gum tissue. This occurs over the next couple of weeks. Once fully healed, we’ll take impressions of your abutments in order to create your customized restoration. If the restoration does not feel comfortable or fit properly, we’ll modify it further until it fits your needs. 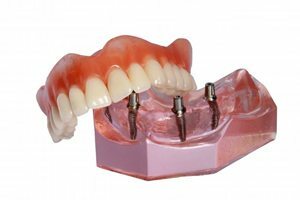 Unlike traditional dentures, implant-retained versions offer a far more stable and reliable fit. No longer will you need to use denture adhesives or get your denture relined and repaired every few years. Furthermore, those who choose a fixed option will not need to practice nearly as much maintenance compared to a traditional denture.